The SHLV Program is currently at capacity and we are unable to accept any new Referrals until further advised. Who can receive family support from Family Services Australia? providing appropriately targeted, short term supports early to prevent escalation of these issues. Who can make a referral to Family Services Australia - Child, Youth & Family Support Program? Individuals can refer themselves and workers, with the consent of the family, can refer their clients. How do I make a referral to Family Services Australia - Family Support Program? If you want to refer yourself to the Service then it’s as simple as making a phone call. Telephone 42 567 333 and ask to speak to the Intake Worker. 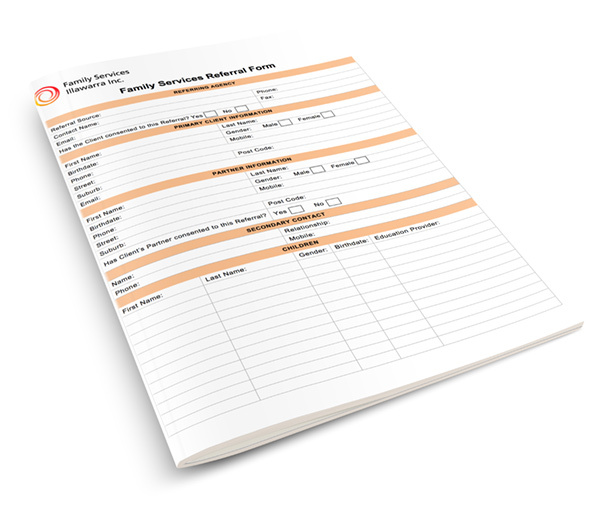 With the consent of your client, download the electronic fillable form from our website. Once you have completed the form and saved it, email the completed form to referrals@fsi.org.au. You will then receive a reply to inform you that we have received your referral. What happens when a Referral is received by FSA? The referral will go to the regular meeting of the Intake Panel where it will be considered and a decision made as to whether or not it is appropriate for FSI to accept the This Panel may also determine whether the family should be offered short term information and supported referral or longer term case managed family support. If a referral is declined the referrer will be advised of the reasons for that decision. What happens if a referral is accepted by FSA - Child, Youth & Family Support Program? After a referral has been accepted, and a Family Support Worker is allocated, the Family Support Worker will contact the family and let them know this. Generally the support offered by FSI is either short term (up to 6 weeks) supported information and referral or longer term case-managed family support (up to 12 weeks with a possibility of extension on review to 6 months).The duration of individual services will vary in accordance with the assessed needs of the client. Where it is unclear whether the family’s needs will best be met through short term or longer term support the Operations Manager will arrange an initial assessment in the family home. This assessment will help to determine what level of support the family will be offered. What happens if a referral is declined by FSI - Child Youth & Family Support Program? When a referral is not accepted by FSI the person making the referral will be notified in writing within 5 working days of the decision and provided with the reason for the referral being declined. FSI is unable to make contact with the client. How long will it take after a referral is accepted for services to be delivered? How can I find out where I am on the Waiting List? Where you are on the Waiting List is not a good indicator of how soon you will be allocated a support worker because it is very difficult for FSI to estimate when a vacancy will occur in our family work program. If you are concerned because you have not heard from us, then please contact the Operations Manager on 42 567 333. What do I do if I have any concerns about the Referral and Intake processes of Family Services Illawarra? If you have any questions or concerns about services provided by FSI you should feel free to contact the Operations Manager on 42 567 333. If the Operations Manager is unable to resolve your concern to your satisfaction you will be put in touch with the Chief Executive Officer. In the event that we are unable to resolve your concern you will be advised of other avenues available to you. Who can receive support from Staying Home Leaving Violence? Women 18 years + (and their children) living in the Wollongong Local Government Area who have separated from a violent partner, or family member, but choose to remain in their own home, or a home of their choice. Women 16-18 years referred to the Project will receive assessment and referral services. The focus of the Project is to assist women to manage the long term impacts of domestic violence with a focus on sustaining housing, financial stability and education. How many women can the Project work with? The Project is funded to provide long term case managed support to 36 women (and their children) per year. A further 15 women can be provided with case coordination each year. The Project will also provide an information and referral service to other women who meet the SHLV eligibility criteria. Who can make a referral to Staying Home Leaving Violence? Women can refer themselves and workers, with the consent of the woman, can refer their clients. How do I make a referral to Staying Home Leaving Violence? If you want to refer yourself to the Service then it’s as simple as making a phone call. Telephone 42 567 333 and ask to speak to a Staying Home Leaving Violence staff member. What happens when a Referral is received by SHLV? What happens if a referral is accepted by SHLV? What happens if a referral is declined by SHLV? When a referral is not accepted by SHLV the person making the referral will be notified in writing (generally by email) within 2 working days of the decision and provided with the reason for the referral not being accepted. Another Service is considered more appropriate to meet the woman’s needs. The resources of SHLV do not allow for this woman to be prioritised at this time. There is an unacceptably high level of OH&S risk associated with the woman’s circumstances. The referral is considered Inappropriate for other reasons. The referred client does not want to receive services from FSI. What do I do if I have any concerns about the Referral and Intake processes of SHLV?